Betty Petschek, New Canaan, works on a painting at Elizabeth Gaynor's Southport, CT studio on Monday, February 28, 2011. Westport's artistic roots go back at least a hundred years. And for that long, artists have been drawn to the creative spirit that dwells within its borders. Since the early 1900s, professional illustrators and graphic designers have set up their easels alongside fellow artists whose avocation is sketching and painting. Although called "sketch classes," these weekly gatherings include no formal instruction, said Howard Munce, a long-standing participant and one of Westport's most noted artists. 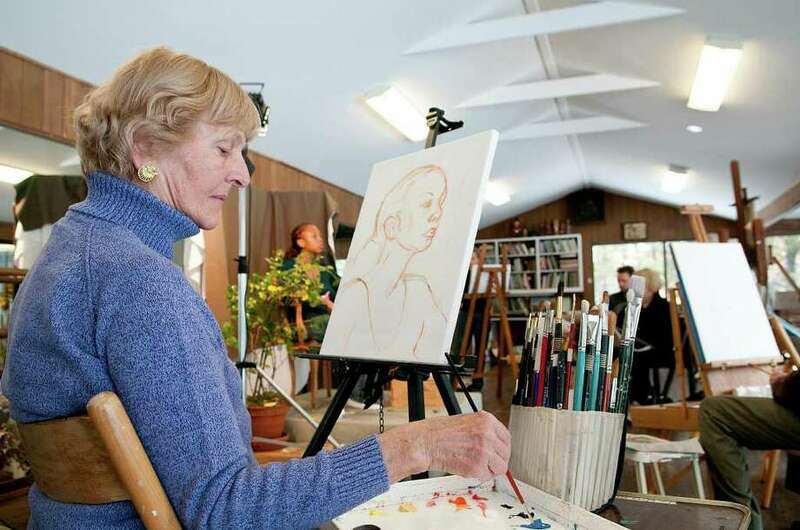 Instead, the current group -- which meets Monday and Wednesday afternoons in a renovated barn on artist Elizabeth Gaynor's Southport property -- provides the opportunity for artists to hone their skills by sketching and painting a live model. Throughout the months of March and April, their work is featured in an exhibit at the Westport Historical Society called, "The Sketch Class: A Westport Tradition." The three-hour sessions are canceled only for severe weather. This winter, Gaynor was forced to shut the studio down for several weeks because her long driveway was filled with piles of snow. To the delight of the artists, the group was able to reconvene two weeks ago. In between breaks -- which occur every fifteen minutes so that the model and the artists could use the bathroom, grab a cup of tea and snack and socialize -- the artists spoke about the history of local sketch classes and some of the less-than-oppulent locations in which they met. Gaynor recalls hosting an early-1960s sketch and painting group with live models in her basement. Then in the late '60s, she met artist Joey Tate in a ballet class at Bambi Linn's dance studio in Westport. Discovering that they shared a love of painting, they formalized the sketch group by renting space in an old ping-pong-ball factory on Riverside Avenue. "We accessed a second floor `studio' by an outside fire-escape and wooden stairway," she recalled. "One day when we arrived, the stairway had collapsed. The building was condemned soon after." So the artists moved to space in another old factory building, this one on Richmondville Avenue. When the vacant Greens Farms School was transformed into the Westport Arts Center in the 1980s, the artists excitedly took up residence there, Gaynor said. In addition to Gaynor, artists at the sketch classes during those years included Sephen Chinlund, Gamal Eleish, Paul Heifetz, Robbie Hill, Judy Kamerschen, Elisa Katchian, Andy Neilly, Betty Petschek, Charlie Reid, Marianne Rothballer and Gene Wilder. When the town ultimately took the Greens Farms building back for educational uses, Gaynor offered to host the gatherings in her concerted barn. The structure was the original site of the Connecticut Dance School, which Gaynor founded and remains active as chairman of its board of directors. The long dance barre and mirrors that still line its walls provide an apropos setting where the arts did and still do flourish. Whenever he's in town, celebrated watercolorist Charles Reid hauls his sketch pad, easel, pencils and paints to the barn. Known simply as "Charlie" to his artist friends around him, Reid also is well known as both an art teacher and author. "Some say that he is the best water colorist in the United States today," Munce advised. When Reid is not painting, he leads workshops at venues all over the world. Asked about his continued presence at the local sketch class, Reid automatically replies, "All of my friends are here, and it's a wonderful institution." The camaraderie is definitely a draw for the artists, and many said that they like being around people who share a similar passion for art. "It's such a great group," said Petschek, a New Canaan artist who has participated in sketch classes around Westport for 25 years. Wendy DeMaiorebus Pieper, a Westport native, feels fortunate to have found the sketch class. In her 40s, Pieper is one of its younger members. "Getting here is awesome," the mother of three said. "The artists are all so talented and yet so unassuming." Like several of the artists, Pieper also is a member of the Silvermine Art Guild and the Rowayton Arts Center. The sketch class "monitors" are responsible for hiring models. Marianne Rothballer has that duty for the Monday classes while Kathy Draper and Cornelia Olsen handle it for Wednesday classes. With a chuckle, Rothballer said that she's always on the lookout for "interesting people with character." "It's fun to paint pretty women," Petscheck said, "but I prefer to paint an interesting face." "We have all different types," Rothballer said. Models are paid $20 per hour. Most of the time they pose fully clothed; sometimes they wear costumes. New Canaan artist Judy Kamerschen appreciates that models are willing to sit for extended periods of time. "It's nice that we don't have to do quick sketches," she said. Kamerschen has been attending the classes on and off for many year, she said. "I like the fact that it's a mixed group of men and women and with different ages." The artists also have varying degrees of experience. While some have worked professionally for decades, others have not. Gamal Eleish joined the class after retiring from an important post at the United Nations. A Fairfield resident for more than 40 years, Eleish recently completed a pen and ink series based on photographs of the BP oil spill, which he plans to display in an exhibit. Gaynor talked about common bonds. "The opportunity to work with a model in a sunny studio, plus the camaraderie and artistic support of a very congenial group is what binds us together," she said. "It is always a pleasure. Many [who attend the Monday class] tell me that Monday is their favorite day." The Westport Historical Society is hosting "Sketch Class with Elizabeth and Howard" in the Betty and Ralph Sheffer Gallery on Tuesday, April 5, from 1:30 to 3:30 p.m. Admission is $15 for members, and $20 for non-members. To register, call 203-222-1424.